Qi-certified by WPC (Wireless Power Consortium) to support wireless charging on all Qi-enabled devices. If your product does not have certification it might not be safe. Check your compatible device’s battery level with ease using the charger’s LED indicators. While charging, the charger glows blue. When fully charged the light will switch off. Wireless charging is a convenient way to charge your devices without using cables. Simply place your wireless charging compatible phone onto a charging pad and your device will automatically start charging. Lead by two industry standards, the Wireless Power Consortium and the AirFuel Alliance. Qi pronounced “Chee” is the name of the wireless inductive charging standard from the Wireless Charging Consortium. It is the most widely supported standard in the market and supported by brands such as Samsung and Apple. Qi uses inductive charging whilst Air fuel uses resonance based technologies. Inductive and resonance based technologies produce quite different results, despite being based on the same engineering principle that coils of wire can be used to transmit power over the air. Power is transferred from a transmitting coil in the charging pad to a receiver in your device. Generally speaking, wireless charging (5 watts) is 50% slower than charging by cable. With 9 watt fast wireless charging, that reduces to 25% slower and with 15 Watt super-fast wireless charging the times are comparable to Cable Charging. Wireless Fast Charging 9watt or 15watt will require a Fast Charging enabled phone. Check with your supplier for compatibility. Qi now the dominant force in wireless charging supports a range of phones with all new Samsung and the new iPhone 8, 8 Plus and X being supported. If your phone does not have a receiver built in you can always purchase a receiver to plug into the USB-C, Lightening or Micro USB slot on your phone. They can be easily purchased online. How long does Qi charging take to charge my device? On Standard Wireless 5W (1amp) charging your device will take about twice as long to charge as if it were charging on a standard charging cable. However some charging cables will charge at the same speed. It will depend what charging adapter you use. Check to see if your cable adapter gives out 1Amp, 2Amp or 2.4Amp or 3Amp. Is it safe? Can I leave the phone on there? Yes. The electromagnetic field generated by the transmitters are localised and only operate over short distances. Inductive charging has been used in many applications, such as your electric toothbrush, medical devices and much more. Where can I use a Qi charging product? You can use your Qi charging pad wherever you have access to a USB A port. Places such as your car, home or office via your pc or laptop. You could even connect it to a standard power bank. 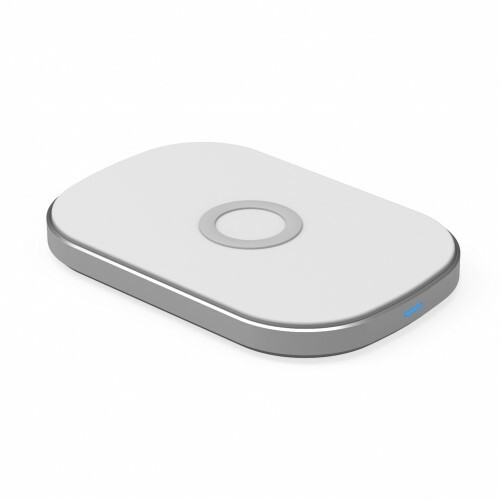 Or you could use a Qi wireless charging power bank with a Qi transmitter built in. Then you can wirelessly charge your phone anywhere. What’s the difference between licensed and not licensed? There are various options available for wireless charging. Some are certified by the Qi Wireless Consortium, the governing body for Qi charging. Look for the Qi logo to see if your model is certified. Whilst models without the Qi logo will work, those with the Qi logo have been tested and approved by the consortium. Do I need to remove my phone case before charging? Your phone must be within 3mm distance of the charging pad to charge successfully. Some phone cases can be quite thick and obstruct charging however most cases will not affect the capacity to charge your phone. What about Apple Watch and Apple Airpods? New generation Apple Watches 3.0 and Apple Airpods support wireless charging however Apple has decided that they should only be compatible with the Apple “Air Power” charging standard. Whilst the technology is the same as Qi, Apple has decided to create their own charging standard for these two products. Laser Qi Wireless charging pad is the future of phone charging. Simply place your Qi compatible phone onto the pad. Qi Certified wireless chargers have been tested to verify that they not only work but are safe to use. If your product does not have certification it might not be safe.